U.S. 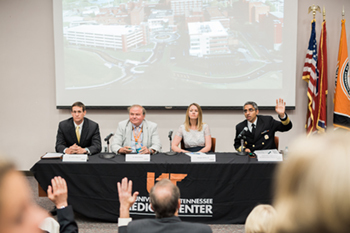 Surgeon General Dr. Vivek H. Murthy met with doctors, lawmakers and a host of clinicians and other community leaders at The University of Tennessee Medical Center to discuss and seek solutions in the opioid abuse epidemic afflicting the nation, and hitting particularly hard in Tennessee. According to Tennessee Department of Health records, at least 1,263 Tennesseans died of opioid overdoses in 2014. Knox County recorded 133 overdose deaths that year. 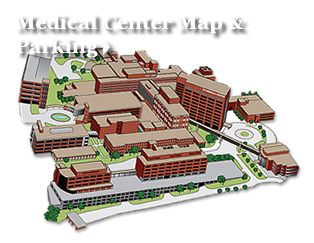 Physicians, nurses and staff treat drug addicted patients of all ages, from senior citizens to infants born to drug addicted mothers. During his meetings on the Knoxville campus of the academic medical center, Dr. Murthy called for more action and greater education in the fight against the opioid crisis. Overdose deaths from prescription opioids have quadrupled since 1999, according to the Centers for Disease Control. From 1999 through 2014, more than 165,000 people died in the U.S. from overdoses involving prescription opioids. Methadone, Oxycodone and Hydrocodone were the most common drugs involved in prescription opioid overdose deaths during that timeframe. During his visit to the hospital, Dr. Murthy spoke with and heard from about 350 people with a strong interest in the topic. Craig Towers, MD, Professor of Obstetrics and Gynecology, is working to decrease opioid dependency in both pregnant women and their babies. Neonates born drug dependent suffer from Neonatal Abstinence Syndrome (NAS). Findings from a study recently completed by Towers, published in the American Journal of Obstetrics and Gynecology, showed no adverse fetal outcomes when women were detoxed during pregnancy. Towers’ findings may offer an alternative to the long-term standard of care which suggests waiting to detox women until after the babies are born. The five-year observational study of more than 300 opiate-addicted pregnant women also included an intensive behavioral therapy component. According to the National Institute on Drug Abuse, the number of babies born with NAS in the U.S. grew five-fold between 2000 and 2012, with more than 21,000 infants suffering from the syndrome. As Surgeon General, finding innovative solutions to address the nation’s opioid epidemic is one of Dr. Murthy’s top priorities. He is currently touring numerous cities, discussing the topic with people from across the country in an effort to combat the situation.